This week’s Photo Challenge, hosted by Cheri Lucas, is “Solitary”. This time of year feels anything but solitary to me, but there are always moments when people are alone with their thoughts. 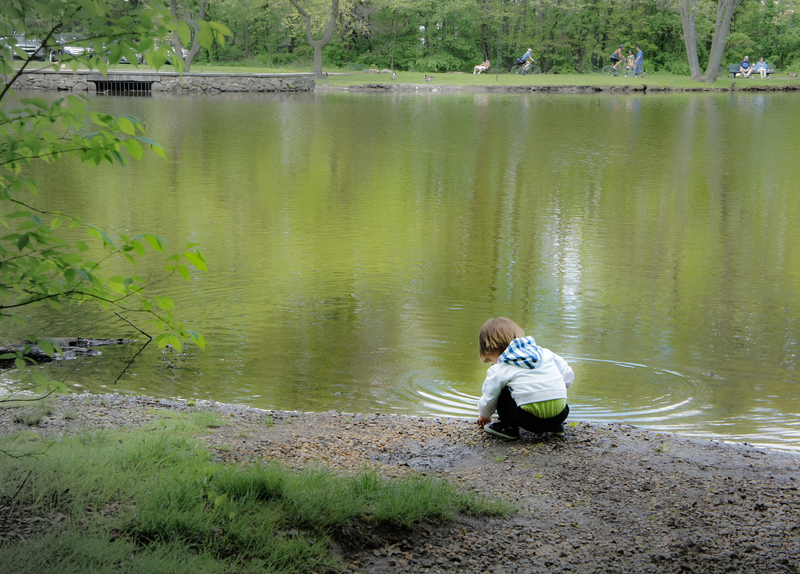 When you think about it, just about any kid in the world who has the chance will play with water. I wish there was no hunger and adequate water, especially for kids, because I know some children will never enjoy playing alone like this. This man has been around and seen a lot, I suppose. 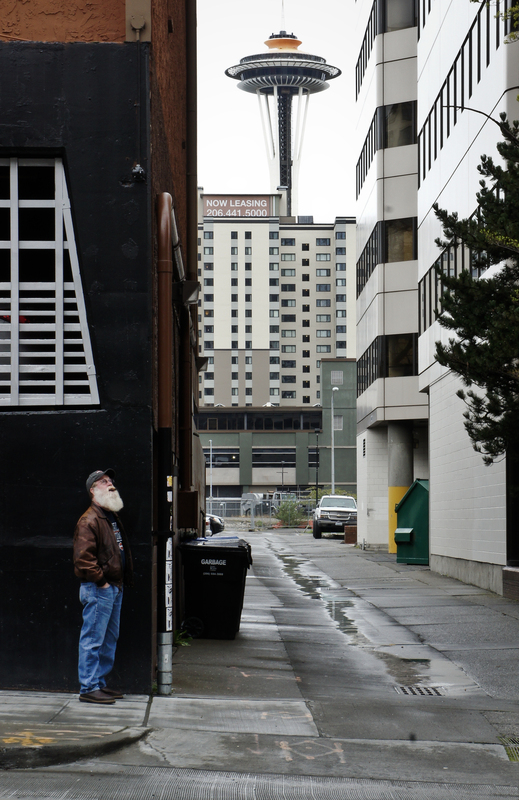 On an overcast spring afternoon he enjoyed a cigar and a solitary moment in an alley downtown. Seattle’s Space Needle brings everything into focus – or not, depending on your aesthetic inclinations. I was in the right place at the right time on this November evening in lower Manhattan. 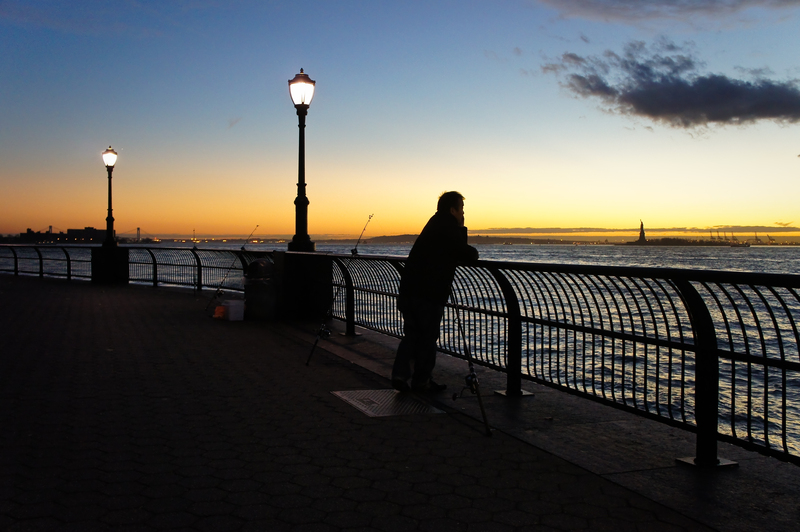 The Statue of Liberty provides a focal point for this man’s thoughts as the sun sets over New Jersey. 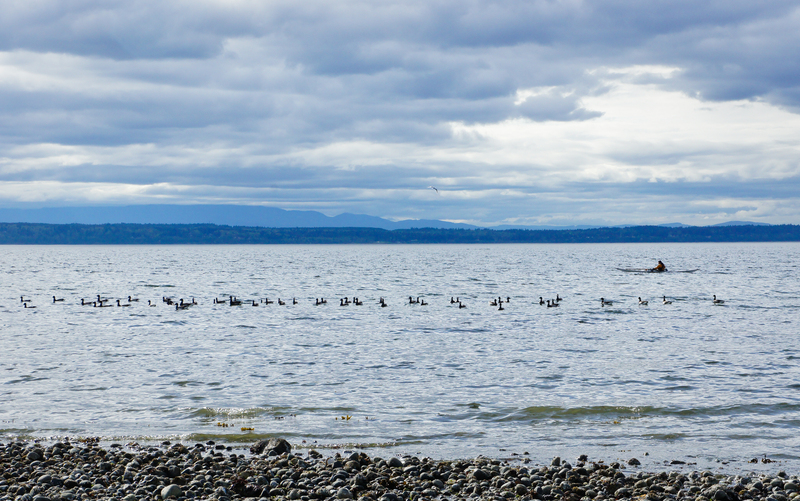 A lone kayaker on Puget Sound, north of Seattle, drifts near a flock of brant. I have yet to see a brant alone, on the east or west coast – they are decidedly gregarious, and they make the most appealing guttural murmurs while plying the shoreline together for bits of eelgrass and other marine plants. The Great Blue Heron, however, almost always hunts alone. 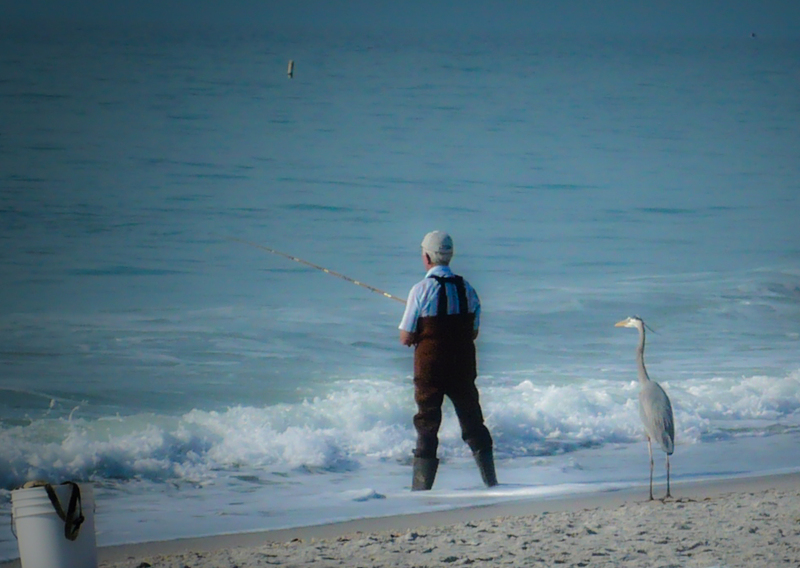 But on this warm January afternoon on Florida’s Gulf Coast, the heron stuck close to a solitary fisherman, whose bucket of bait was too tempting to let out of sight. Running up and over the railroad tracks – another seriously fit Seattlite taking fitness seriously. I’m serious. They’re everywhere, making me feel guilty or inspiring me, depending on my own turn of mind. 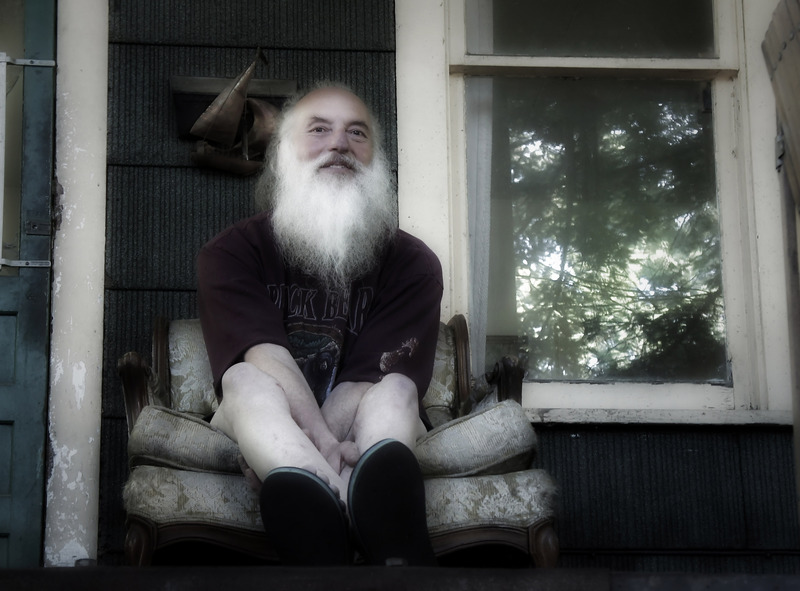 This is Larry, who lives alone in an old home in Seattle’s Georgetown neighborhood. Though he talked a blue streak the day we met him, he was clearly a man content spending most of his time alone. I think his inspiration comes from inside his own mind and from nature – those trees reflected in the window are about to completely obscure his home, and he told us he won’t cut a single branch, not ever. 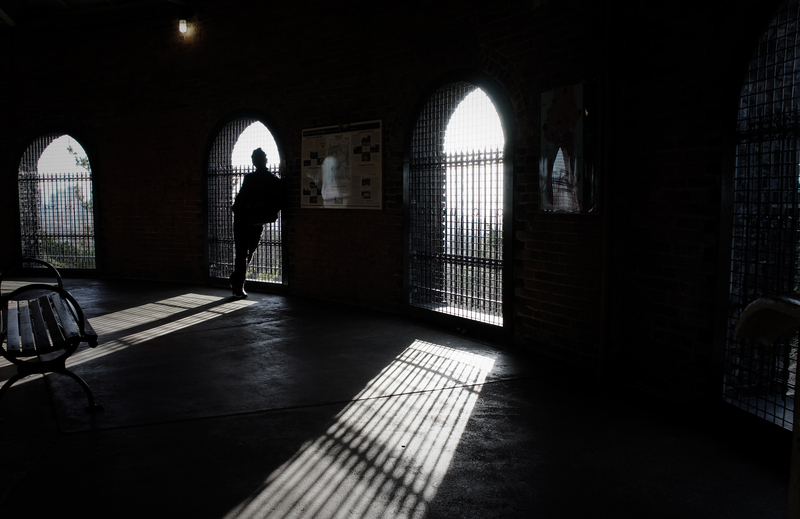 A young man leans against the barred window of a water tower, high above Volunteer Park in Seattle. A perfect place for a little solitude. This entry was posted in photography, Weekly Photo Challenge and tagged alone, brant, Captiva, children, fishing, FLorida, heron, kayak, Manhattan, Puget Sound, Seattle, Space Needle, Statue of Liberty. Bookmark the permalink. Thank you so much, stranger! Thank you so much – the challenges are always fun to think about. Well seen situations beautifully captured and very well matched to the challenge. It amazed me – I’ve never seen a heron allow people so close – but Florida can be great that way – I was closer to a lot of birds & animals than I could get in other places. thanks! Loved your visually poetic expression of solitude… Thanks for visiting and leaving your warm footprints on my self-exploration of Solitude (http://sreeniviews.wordpress.com/2012/09/25/solitary-the-greatest-thing-in-the-world-is-to-know-how-to-belong-to-oneself/). Warm regards and love. OK, I have to try your suggestions. I do struggle with composition, typically wanting “everything” in the picture – it’s my personality – I see so many things & I think the juxtapositions are so interesting, and the complexity of it all – and I want to embrace it all – but for photography, I have to remind myself that often it needs to be cut way back. Thank you very much for taking the time to offer your comments – I really appreciate it – it’s what we hope for, right? Wonderful post. I loved seeing all the familiar images. Thank you Naomi – much appreciated. Very nice, even without a setting you can tell Larry is accustomed to a solitary life. The man smoking a cigar in the towering city also hits the solitary nail on the head. Some of your photos have a very surreal quality, I can’t tell if it’s done in post production. Thank you very much – sometimes I do a lot in post production, sometimes not so much. Certainly I look for odd combinations of visual elements that can be surrealistic. The man in the alley – not much fiddling around except to balance the bright light; Seattle’s Space Needle is a gift that keeps on giving by appearing within the oddest arrangements of buildings. As for Larry – I removed a lot of color & dialed the Clarity way down (Lightroom) to give it a soft glow – to get the feeling of the glow I felt around him.